​ Holidays with the kids can be difficult to plan- finding that compromise between keeping them entertained, but at the same time finding something appealing for the adults is never easy. Bring your family to the little known region of Le Marche, in central Italy, to stay in a beautiful agriturismo (working farm). 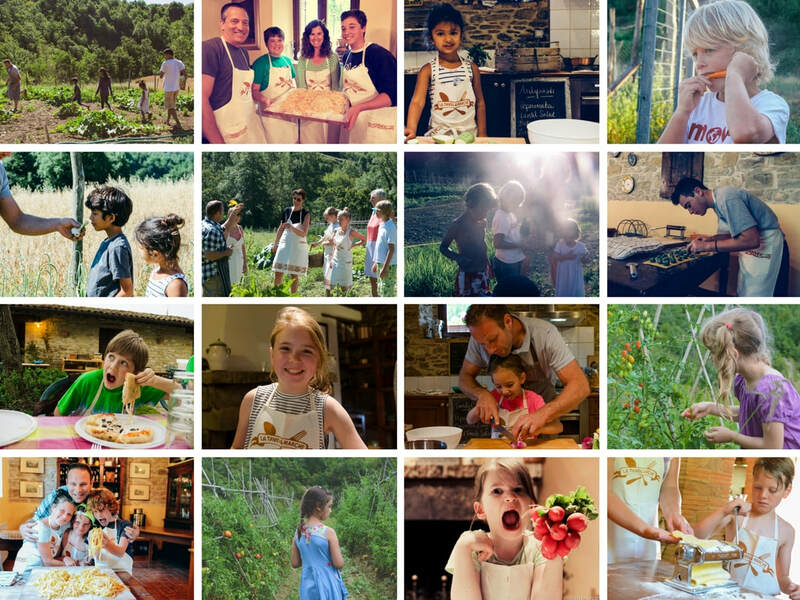 Enjoy a family cooking lesson, picking veggies in the garden, pizza night and chilling out by the pool! Unplug & relax in the Italian countryside. Our farmhouse is located deep in the countryside but with an hour you can be spending the day at the beach! This family holiday is all about having something for everyone! That's why decided to create "Family Week" so both the kids and parents can enjoy their time in the countryside! Included in the price is one half day cookery lesson for the whole family. You will pick the ingredients from the vegetable garden and will all get your hands dirty!! 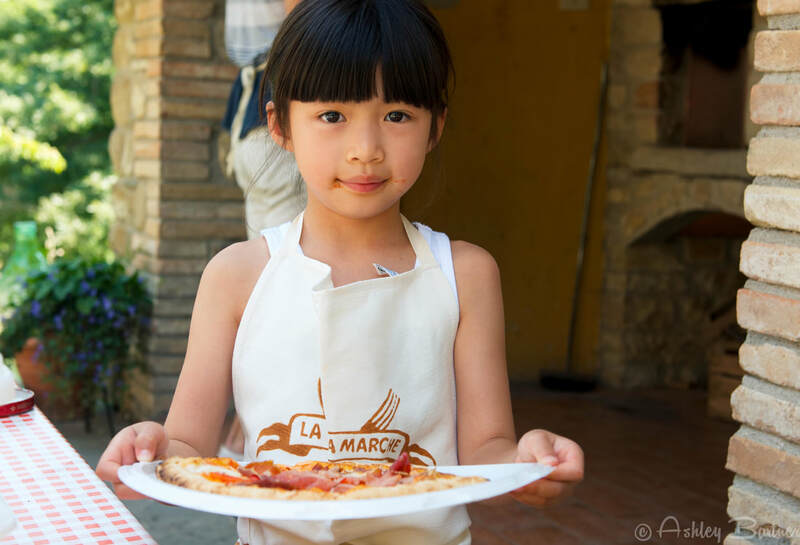 Even if all the kids make at home are a peanut butter & jelly sandwiches - they will love making pasta or pizza in Italy! Get your hands dirty - start by making the dough from scratch, fire up the wood burning oven, make the sauce & toppings, then try your hand tossing the dough! And for dessert we will create the most delicious tiramisu! You are free to relax around the pool, or explore the local area. You can explore the town of Urbino, whose historical district has been designated a Unesco World Heritage Site, or the enchanting medieval city of Gradara or in under an hour arrive at the seaside town Fano packed full of beach lovers and fabulous gelato to enjoy! The stone farmhouse also houses the cooking school and other apartments which most likely will be filled with guests. Your apartment, named Ciliege (cherry) after the fruit grown on the farm, has a rustic style to match the surroundings - wood beams, tiled floors and stone walls. It is equipped with its own kitchen and espresso maker so you can self cater. There are two bedrooms, one double and one with two single beds. Both of the bedrooms are ensuite, so you don’t need to share a bathroom with your children! Outside of the sleeping accommodation, there is a lovely pool which is shared between you and the other four apartments. A five course dinner with local wine on your first night is included. As all meals & cooking classes uses seasonal ingredients, there's no predicting what will be on the menu. A bistecca night for the adults & bbq dinner for the kids as well as our family-style pizza night are also included in the price. The rest of the time, you are able to self-cater – you can choose to cook in the apartment, or you can eat at a local restaurant or dine with us at the farmhouse! Date Night: Adults dinner - a beautiful Bistecca Fiorentina for two with sides and desserts and Kids: Grilled Sausages & salad - everyone wins! Breakfast Daily = 10 Euro/person (5 Euro/kids under 5 years old) or you have a kitchen in your apartment as well. Feel like a Local Friday Market Tour/Tasting and Lunch - this is so much fun for every age! We eat our way through Apecchio our neighbouring village - stopping at our friends cured meat & aged cheese warehouse for a tasting & short lesson on how it's done here, then we walk the market, visit the local brewery for another tasting and then big proper Italian lunch in hidden in the hills above town! "We have just returned from a wonderful week at La Tavola Marche. Our apartment was spacious and comfortable, and the food was fabulous, especially the "welcome feast". The location is lovely with beautiful views in all directions, and being well off any main roads was perfectly safe for our two girls (7 and 5) to run-around. Jason and Ashley are wonderful hosts and went out of their way to look after us - the "family cookery class" and the daily trips to feed the chickens and collect their eggs were especially popular with the girls, as more obviously were the pool and the swings! The local towns also have plenty to keep everyone interested if you do want to get out and about a bit. Urbino is the most famous town nearby, but all the local towns we visited had things of interest - the Brancaleonie palace in Piobicco and the mummies in the Chiesa dei Morti (Church of the Dead) in Urbania are well worth a vist to name just a couple.